Holidays are never long enough, but now we are back at work. It seems nobody stopped knitting while we were away! We came back to a bumper delivery of boxes and parcels large and small. We do try to acknowledge every donation but we are a small team, so bear with us. Over the holiday period parcels have been taken to Delhi through the generosity of the ex-pat network. 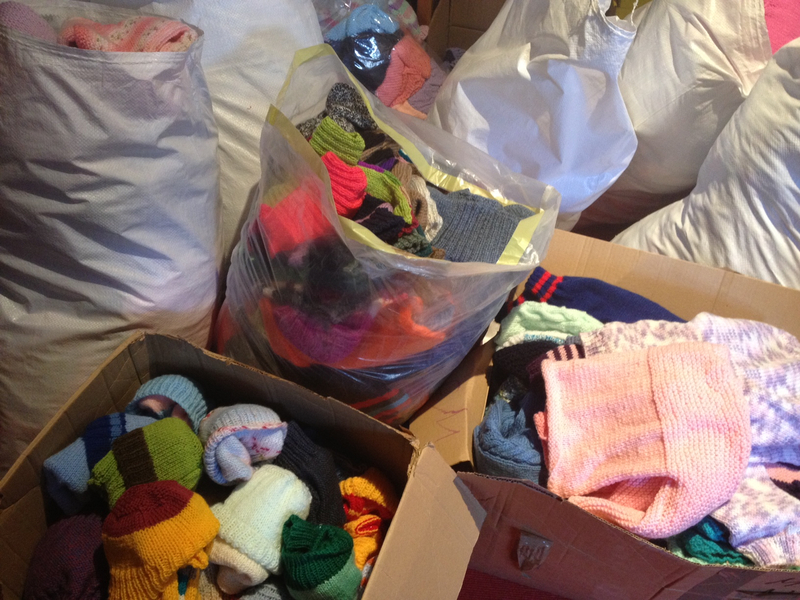 We have also sent over 200 baby hats to Kofia (Knitting for our friends in Africa) who are supporting Berega hospital in Tanzania. There is a room for premature babies in Berega Hospital. It is simply just that – a room which is kept slightly warmer, where Mums stay constantly with their babies; she must pay for the health care she receives. Her food, whilst she is there, is cooked by a relative in the outdoor cooking area, and brought in to her. 4 million newborn babies die each year worldwide. 99% of those babies are in low and middle income countries. Most of those babies die in the first week, 25- 45% of them in the first 24 hours. Prevention and treatment of hypothermia can help reduce mortality and morbidity by 18-42% – (Unicef). Randomised control studies have shown that a hat is just as effective as a heat lamp at preventing hypothermia in healthy babies (that’s all they have, one light bulb). Although hot during the day there can be a severe temperature drop during the night. That’s where the danger is for a newborn and that’s where we can help.